21 of the 122 lizard species, or about seventeen per cent, belong to the Whiptails, Racerunners & Ameivas family (Teiidae). They are mostly a Southwest species. About one dozen species, for example, have been documented in Arizona. Take a hike anywhere in the state and at least a couple of species will be in camera range. If that were the end of the Whiptail lizard story, it would be time for some comparative pictures for identification purposes. Wait, there’s more. 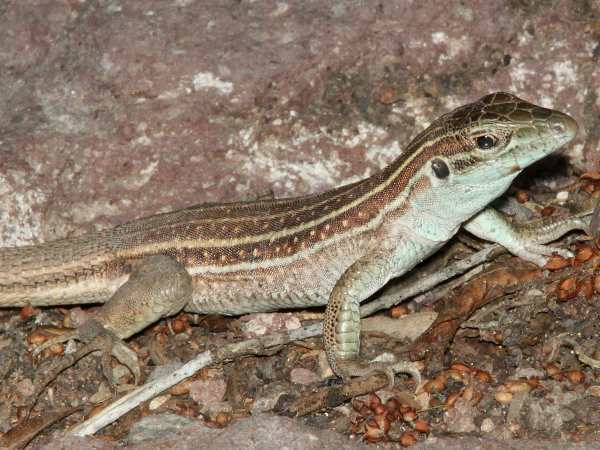 It’s impossible to talk about Whiptail lizards without reference to their reproductive behavior. Some of the species, but not all are parthenogentic. They have the ability to reproduce their young asexually, without the aid of fertilization. True parthenogenesis, characterized by the complete absence of male contributions, has been described for various species of reptiles including whiptail lizards, geckos, blind snakes and rock lizards. 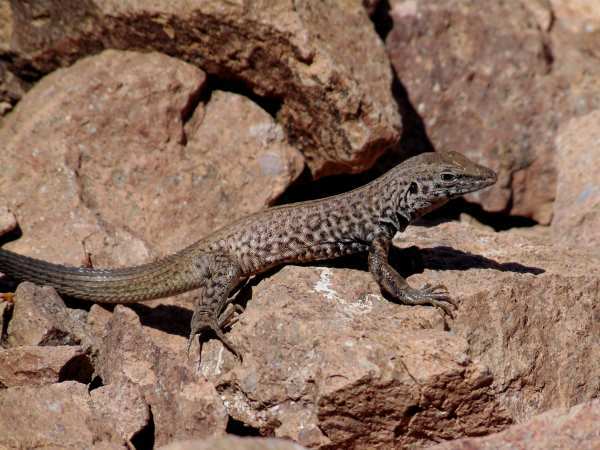 Whiptail lizards of the genus Aspidoscelis, formerly part of the genus Cnemidophorus, are mostly native to the Southwestern United States and Mexico, and about one-third of the more than 50 species reproduce by obligate parthenogenesis. The study initially concluded that the presence of a double set of chromosomes in certain species aided the division of cells during the reproductive phase that mimics the fertilization process. Hence no need for fertilization. The pictures show slight differences in a handful of the native species. For example, some species have stripes. Some species have spots. Other species have a combination of stripes and spots. Those physical features along with geography are usually sufficient for identification purposes. 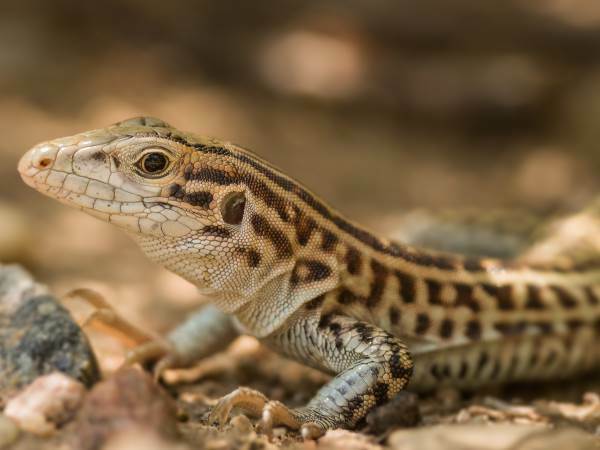 Texas Spotted Whidocuments ten whiptail species, most with a very limited range. 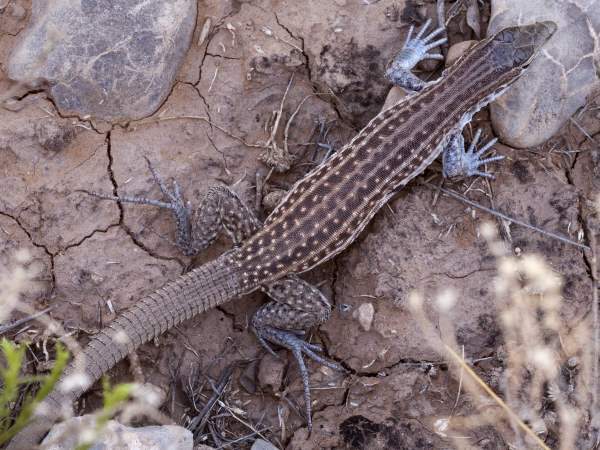 The Desert Grassland Whiptail, for example, can only be found in the El Paso area of West Texas. The based on museum voucher specimens. 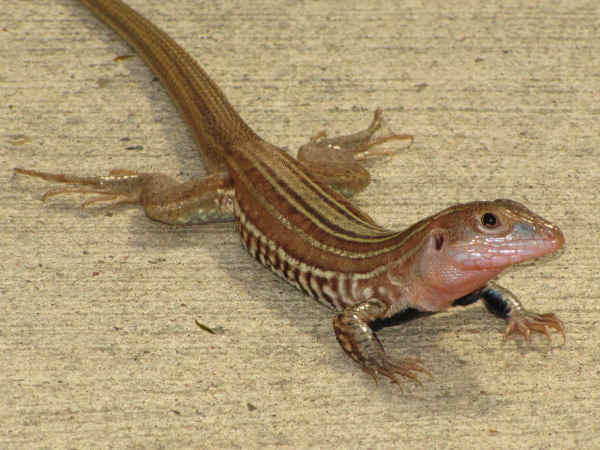 Laredo Striped Whiptail is a checkered species found in the border counties along the Lower Rio Grande River. The Texas Spotted Whiptail (Cnemidophorus gularis) in the picture is the most wide ranging of the species. It calls almost of all Texas along with some parts of Northern Mexico home. From a distance the top of the lizard looks green and the tail section looks red. A closer look reveals the spotted legs with the traditional striped body. Checkered Whiptails are fairly common from Arizona through Oklahoma. The checkered body contrasts with the stripes and spots of the spotted whiptails, making for easier identification. 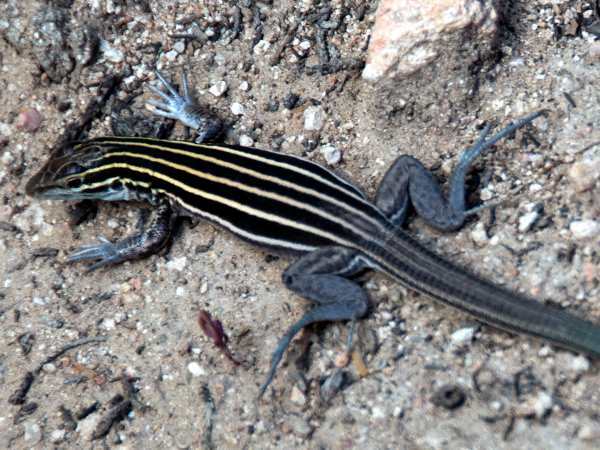 Cihuanhuan Spotted Whiptail lizards (Aspidoscelis exsanguis) have six stripes on the body with spots between and on the stripes. The name Chiuanhuan is indicative of their residence in the Chiuanhuan Desert region of New Mexico, Texas and Arizona. Gila Spotted Whiptail lizards (Aspidoscelis flagellicauda) also have stripes and spots on the body. Geography is the best field identification clue. They have a narrow range in the woodlands across central Arizona, with a spillover into the Gila Wilderness areas of New Mexico. Sonoran Spotted Whiptail lizards (Aspidoscelis sonorae) are heavily spotted and striped. They reside in the Soonora Desert region of Southeast Arizona. Five different subspecies of Tiger Whiptails (Aspidoscelis tigris) are documented. They are one of the most widespread of all the whiptail species. 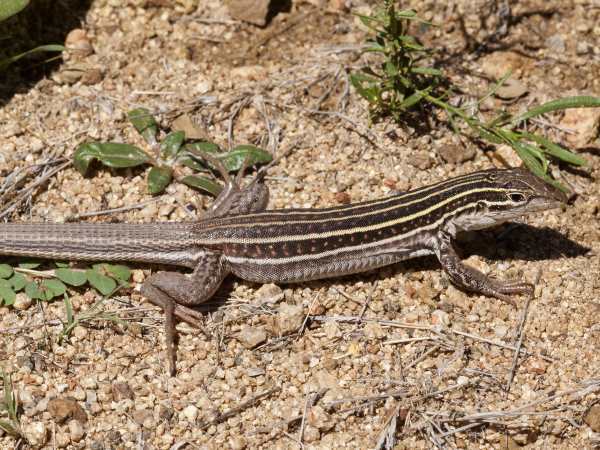 Plateau Striped Whiptail lizard (Aspidoscelis velox) are residents of the high desert regions of the Southwest, including Utah and Colorado. Aslo look for them on a trip to the Grand Canyon. Interestingly enough a small introduced population was established in the high desert region of Oregon. As the picture shows, they can be identified by the presence of multiple stripes on the body.